From the top of the peak we could see a gentle slope dropping off to the east a few hundred vertical before it rolled off into a cliff-lined constriction and was obscured from our view. Assuming the chute went through, it would take us all the way to the bottom of the mountain to within a short traverse from the snowmobile. The alternative was less attractive: backing down the skin-tracks we’d just etched over a long and undulating knife-edge ridge, then descending the same low-angle slope we’d come up, thus giving up nearly all our hard-earned altitude with nary a turn to show for it. And then there was the prospect of two hours or more of skinning and/or poling as we circumnavigated the north flank of the mountain back to the ‘bile which was our ticket down into the valley. Even so, normally this would be a no-brainer: when in doubt, ski down what you’ve come up, especially when human-triggered avalanches are possible and you have only the sketchiest idea what the terrain beneath you holds. But today was a little different. It was Darren’s birthday, for one thing, and he’d promised his wife that he would without fail be down in the valley by six for a long-awaited dinner date. Tim and Toby had made similar promises to their wives, who’d been meeting the frustrating demands of a brood of small children for the last week while the brothers whooped it up in the champagne powder of the Bear River Range backcountry. These women needed a break, and promises are promises. Plus, the snow in the chute looked amazing. That morning I’d augured the ‘bile into a deep hole a good way below the spot I’d been thinking of as our starting point, and we’d wasted precious hours traversing around the ramparts of the mountain’s north face. Now at the summit, staring down at the untracked powder in the chute that unrolled beneath us, the decision to commit to the line came pretty quickly. The wind had diminished with the frontal passage, temps had dropped throughout the day, and I had observed snow densities lightening throughout the recent storm. On the way up we had heard no audible collapsing, saw no surface cracking, and, most importantly, noted no recent avalanches. Clearly there was some danger, but we decided to try it anyway. The decision was made mutually and with eyes wide open. At the time, the risks seemed both worthwhile and manageable. In retrospect, of course, it is clear that they were neither. I took up position on a ledge above the line. I could only see the upper part of the route, but I shouted up to my partners that they should go ahead. We made our way down the chute, taking turns, reveling in the deep powder, and stopping frequently in the shelter of rocks and trees away from potential slide paths. Three quarters of the way down Darren skied by, made quick work of a very steep middle face, and called up to give me the okay when he’d found meager cover below a battered Douglas fir on a small sub-ridge just above the next and final drop, which was too steep for any of us to view. So far so good, but the angle of the slope was making me nervous. He let out a whoop as he dropped into the hourglass. I watched with some apprehension as he skied a clean but very committed line, and felt relief when I saw him ski in below the fir to join Darren. Darren shouted up to me that the line was clear. As I traversed into the fall line I understood the full sketchiness of our position. The slope rolled funnel-like through a narrow constriction, and then it got even steeper as it opened up again onto a middle face, which was divided down the center by a subtle sub-ridge. I could see thin cracks in the surface sketching frown-like lines under the rocks on both sides of my partners’ tracks. Tim was my only brother. Darren was a long-time friend and favorite touring partner. They were huddled below me, on a thin spur directly on the fall-line, tucked precariously behind the only tree in sight. Taking a deep breath, I dropped through the bottleneck and out onto the steep middle face. As the third skier down, I didn’t expect to trigger an avalanche. But mid-turn I noticed, in the outer limits of my peripheral vision, a slab breaking apart across the slope, the smooth untracked snow above and to my left shattering like a pane of glass. Instinctively I skied sideways off the moving mass, yelling the word “AVALANCHE!” at the top of my lungs. Then I watched with an indescribable feeling of helpless terror as the slide ran toward my two partners, who were crouching uncomfortably beneath the flagged lower branches of a precariously rooted fir perched above a hundred-foot cliff. I yelled again, but even as the sound left my lips the snow-cloud from the fast-moving avalanche obscured their position, and they were gone. Darren and I leaned uphill into our tree, grabbing hold of the strongest branches available. In the next moment the steep gully to our left was filled with a fast-moving torrent of snow. After a few heart-stopping moments the avalanche ground to a halt as it reached the edge of the cliff band, burying the bottom three feet of a snag I’d previously been considering using as a lookout point for examining the next portion of our route. Relief. As the presence of the bedraggled but relatively mature Douglas fir had indicated, the rib was just high enough to keep us from being swept away. As the powder settled Toby, having skied wide to escape the slab, picked his way down through the rubble to the fir, looking pale but extremely relieved to see us. After a brief and tense consultation he skied over to the left to check out one possible route down, which from our angle seemed to spiral alarmingly into the cliff band like some giant’s twisted idea for a drainpipe. This was somewhat difficult to hear. Toby was the avalanche forecaster; the one we were depending on not only for expertise but as a beacon of unshakable confidence. If he was feeling this way, I reasoned, we must really be in trouble. In retrospect it doesn’t seem so bad, but at the time it was one of those moments where you glance around at the snow and the rocks and the sky and try to memorize how they look, because they may be the last things you ever see. The fact is that our only remaining option was to follow the chute beyond the avalanche rubble to the skier’s right, a steep plunge into the unknown hazards of the cliff band. We could have tried to skin up the way we came, but that in itself would have been a huge risk given what we already knew of the gradient and snow stability, and it would have meant being out on the mountain well into the night. Toby dutifully stepped up to the plate. Darren and I watched nervously as he crossed the rubble and disappeared over the roll. After what seemed like an eternity, there was a whoop of triumph from below. Salvation was at hand. 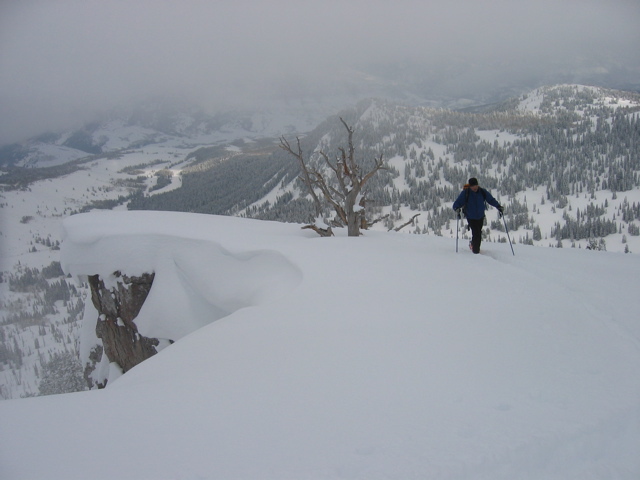 The events on Mount Gog illustrate common mistakes in judgment made by even very experienced backcountry skiers. The season had been characterized by generally stable conditions to the region and lots of fine powder. In short, we’d been stealing big lines for a while and getting away with it, and the combination of epic conditions and a self-imposed deadline enticed us into going after something we shouldn’t have tried. Despite the relatively safe snow conditions, by taking an unknown route in steep and cliffed-out terrain we’d set ourselves up for an accident. On the other hand, by strictly following safe travel protocols, we avoided a fate that was potentially far worse than the temporarily elevated heart rates we actually experienced. This article, co-written with Toby Weed, originally appeared in Backcountry magazine.